On Sunday, October 14th, ECAST members visited the largest national conference of Informal Science Education (ISE) professionals to talk about the World Wide Views on Biodiversity deliberations. With 600 member institutions in over 40 countries, the Association for Science and Technology Centers (ASTC) annual conference brings together diverse program and exhibit designers and educators who work with the public in museums and science centers across the country and the world. In addition to promoting professional development in the field, ASTC supports science centers and museums in proactively addressing critical societal issues, locally and globally, where understanding of and engagement with science are essential. In a double session entitled Participatory Technology Assessment: Including the Public in Scientific Decision Making, presenters gave a series of presentations and facilitated several rounds of group discussion to introduce attendees to the concepts behind the World Wide Views on Biodiversity process and give them first hand experience with the format of small group discussions. The session communicated a provocative example of a public engagement exercise possessing a formal structure for involving a cross-section of citizens in targeted discussions with an explicit aim to reach policy makers. This type of activity is not frequently attempted in science center settings, and so session organizers wished to explore with the wider ASTC audience how ISE professionals view processes like WWVB and relate them to the kinds of programs that they would like to promote at their own institutions. The material for the session and the challenges this model poses for ISEs today is situated in a growing discussion among US and international ISE professionals about ways to shift programs toward a public engagement model where visitors are seen not only as science learners, but also as collaborators in creating a shared social and cultural understanding about the potential and dangers that lie in scientific and technical achievements. 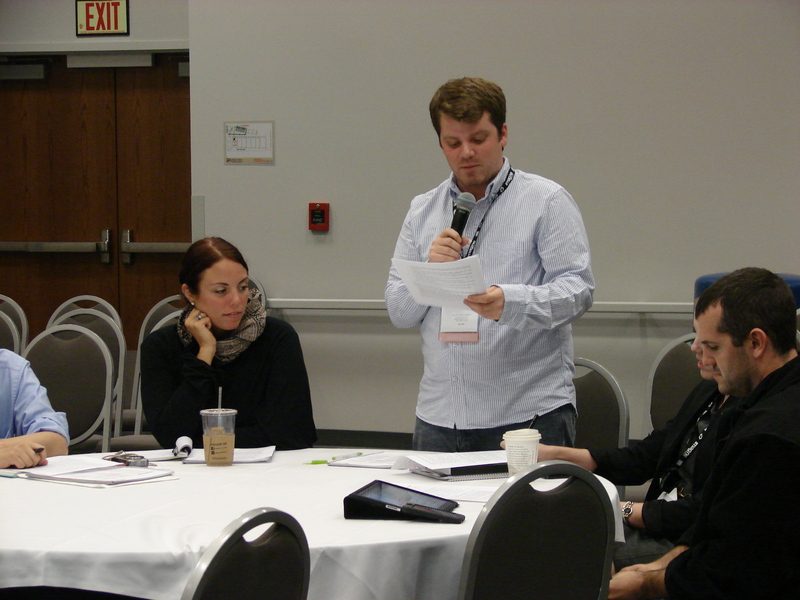 Session organizers* facilitated a sample exercise based on the fifth US national question session from the WWVB deliberations in September. In the spirit of showing rather than telling, session leaders hoped to give a flavor of the kinds of conversations that can emerge in a short time through this type of deliberative model. In addition to modeling the formal deliberations, David Sittenfeld from the Museum of Science Boston also described a follow on public event called Biodiversity Day that will be held at the Museum of Science Boston on Sunday, November 18th and introduced activities that have been designed to be customized by museums interested in conducting programming to let people engage in biodiversity related programming and can provide an informal way for visitors across the country to learn about the formal World Wide Views global event and the outcomes from this meeting. The downloadable activities include a biodiversity quest created in partnership with E.O. Wilson’s Encyclopedia of Life and INaturalist. Sittenfeld invited attendees to take up the activities and customize them. ISE involvement with outreach activities can be seen as part of a broader shift in this community’s mission from one primarily focused on science education, or public understanding of science (PUS), to one of public engagement (PES) with science, a mission frame that refers to mutual learning by experts and the public. This move from PUS to PES has a relatively recent history in the United States. In 2009, the Center for the Advancement of Informal Science Education (CAISE) published its first Inquiry Group report focused on the emergence of public engagement practice in Informal Science Education, with support from the National Science Foundation (DRL-0638981). A significant distinction in public engagement is the difference between traditional “public understanding of science” models, rooted primarily in the one way transmission of information from experts to lay people, and the newer “public engagement with science” (PES) model of mutual learning and multi-directional communication between these parties. In early 2011 under an NSF Pathways award (DRL 1010831, Dimensions of Public Engagement with Science, L. Bell), the Museum of Science, Boston, surveyed over 150 organizations and 201 projects to document the extent to which activities with PES characteristics are being conducted in the informal science education community. The data from this prior work demonstrate that program design, composition, content, and evaluation for PES activities are fundamentally different from those based on the predominant “public understanding” model. PES programs require different organizational supports and evaluation tools. In October 2010, the Association of Science-Technology Centers announced its intention to support a community of practice around public engagement with science to an audience of 130 people, signaling the growing interest in and institutional commitment to this approach. The ASTC session concluded with an open discussion among participants about their experience of the WWVB process, solicited ideas about the utility of these processes in ISE settings and investigated creative ways to confront barriers that this model imposes. ECAST organizers of this session are reminded of the benefits of having ISE partners during the WWVB process and as an organizational partner in ECAST. The community has deep experience communicating with the public, innovative ideas of how to address barriers associate with doing public engagement, and boundless enthusiasm for what is possible: the conversation about PES and models like WWVB continues on the ASTC Connect COP site.